Among the region’s most valued public assets, the library system for Buffalo and Erie County is in the midst of crisis due to the instability of major sources of funding. With the public pushing for the library system to maintain its role as an educational and cultural community asset, the time is ripe to consider alternative library organization models and their implications for governance, service delivery and finances. The institute will assess the tradeoffs of restructuring for the Buffalo and Erie County system by exploring best practices from library systems across the nation, examining data and policies related to organizational scenarios, and drawing upon interviews with library stakeholders within and outside the region. 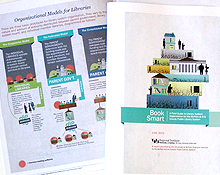 The institute’s findings will be presented as a “field guide” to advise library leaders, elected officials and the public in future policy decisions for the region’s main library system. Findings will be released in July 2011.